Houston began as a town on the bayou – a local trading hub where the railroads met. Since then, the City has become a world capital of industry, growing increasingly international with over 25% of its residents born abroad and more than 100 languages spoken within its borders. 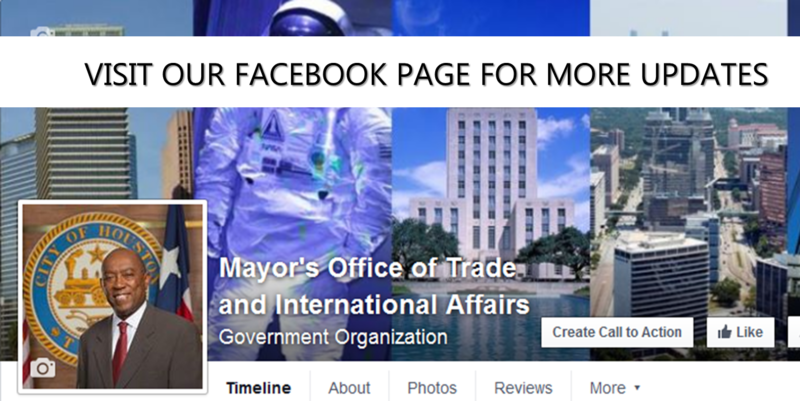 As Houston’s global presence grows, the Mayor’s Office of Trade and International Affairs serves as the City’s international liaison, forming an important link between Houstonians and the world. Whether welcoming heads of state, establishing numerous diplomatic ties, attracting foreign investment or assisting Houston businesses seeking markets abroad, our office works to realize Mayor Turner’s vision of an ever more global Houston. Each year, the Mayor’s Office hosts meetings with over 100 delegations and leaders from countries all over the world, discussing topics ranging from cultural exchange to future trade opportunities. The Diplomacy and Consular Affairs division is both an organizer and a liaison to the Mayor during these important meetings, helping promote Houston and attract future bilateral relationships, while maintaining the high standard of international protocol expected from one of the most global cities in the US. In addition to serving in this capacity, this division is the first point of contact for the 91 members of Houston’s Consular Corps, working to advise consular officials on their interactions within the City and coordinate consulate activities and services. For more information on protocol and diplomacy, please contact our office’s Chief of Protocol, Deanea Leflore. For more information on consular affairs, please contact our office’s International Partners and Agreements Manager, Nike Lugman. As global center of energy, healthcare, aeronautics, and innovation, Houston is a hub of international commerce. It is home to the largest US port in foreign tonnage, two international airports, the largest medical center in the world, and the Ellington Space Port. Over 5,000 Houston companies report doing business abroad, while approximately 1,000 Houston firms report foreign ownership. The international business division focuses identifying synergies between local and international partners, creating and implementing international business development strategies, and coordinating trade missions abroad. The Partners and Agreements division focuses on originating and maintaining bilateral agreements and global partnerships in an effort to secure beneficial relationships between Houston and international parties. On behalf of the Mayor, this division is in charge of Houston’s role in the Sisters City program, which actively reaches out to cities that share political, business and cultural interests with Houston. This division helps coordinates the city's bilateral agreements, which allows Houston to develop special relationships with international cities in a single designated field of exchange (such as medicine, trade, education, or culture) over a two-year period. Each agreement is sponsored by the office of the Mayor or a City Council Member and coordinated by citizen volunteers. The Events and Community Outreach division helps connect local Houstonians with the international community by promoting international events, reporting on international occurrences, and providing updates on recent diplomatic activity in Houston. Throughout the year we plan and execute major events such as the Mayor’s Annual Consular Ball and the World Energy Cities Partnership’s Networking Reception and Corporate Luncheon. For more information on Events & Community Outreach, please contact our office’s Global Engagement Manager, Mazda Denon at Mazda.Denon@houstontx.gov.